People’s Liberation Army Navy (PLA Navy) of China was formed on April 23, 1949. 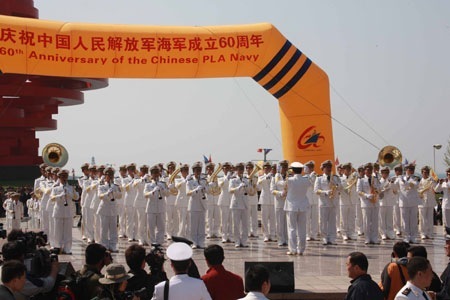 Today PLA Navy completes 60 years.The PLA Navy mainly comprises of submarines, surface ships, aircrafts, Marine Corps and coastal defense wings. Since 1985, the Chinese Navy has sent more than 40 warships to more than 30 countries on goodwill visits, and received more than 100 ships from 30 foreign countries. Admiral Wu Shengli, Commander-in-Chief of the PLA Navy has said that the navy will develop weaponry such as large combat warships including aircraft carriers, submarines with longer range and stealth capability, supersonic cruise aircraft, more accurate long-range missiles, deep-sea torpedoes and upgraded information technology. The grand anniversary is being celebrated for four days from April 20 at Shandong province’s Qingdao city and off its coast. 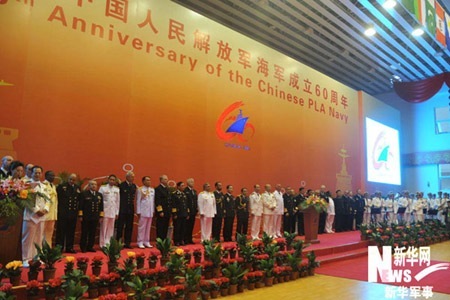 Multinational Naval Symposium (MNS) was held in Qingdao on April 21 with the theme ‘Peaceful Ocean’, calling for more intimate and harmonious oceanic safety, cooperation between countries. International Naval Review (INR) is being held at Qingdao, on April 23. 21 naval vessels from 14 countries are taking part. Delegations from 29 countries are also taking part. Some of them are from: Brazil, Bangladesh, Portugal, South Africa, Vietnam, Indonesia and New Zealand. China will display its nuclear powered submarines for the first time in history during a fleet parade. Magnificent performance by military bands of 7 nations. View photographs from Xinhua News. The Chinese mainland’s space-tracking ship Yuanwang VI will arrive in Hong Kong on April 29 for a six-day visit, to celebrate the 60th anniversary. The Naval Museum in Qingdao, will undergo an extension within 2009 at a project cost of 500 million yuan (US$73 million) and take two years to complete. 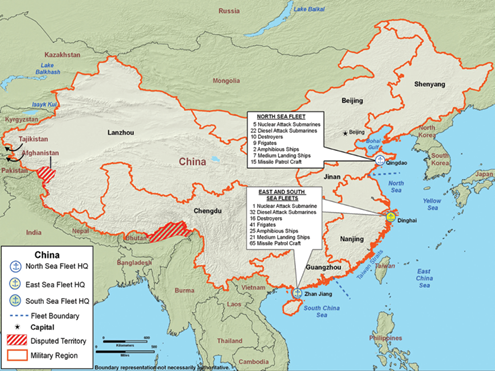 Here is a map showing the present PLA Navy, from: Military Power of the People’s Republic of China by DOD, U.S.
April 23, 1949: Mao Zedong, then chairman of the Chinese People’s Revolutionary Military Committee, and PLA commander-in-chief Zhu De asserted that the country “must build its own air forces and navy in order to boost national defense.” The day was later regarded as the birthday of the PLAN. The early PLAN traced its lineage to 183 units of the Kuomintang’s coastal defense fleet abandoned, defected or surrendered to the PLA. The PLAN set up the surface ship force, coastal defense force, aviation, submarine force and Marine Corps, and established the objective of building a light maritime combat force. November 22, 1949: The PLAN established the Dalian Naval Academy. November 1949: first flotilla of frigates was set up. 1950: First artillery battalion was set up. In the country’s first five-year plan from 1953 to 1957, China spent an enormous amount of money purchasing a number of aircraft, coastal artillery, and combat ships including destroyers, submarines, and torpedo boats. The main task of the PLAN was to conduct inshore defensive operations. 1951: First flotilla of torpedo boats was set up. 1951: The PLAN set up 13 coastal artillery regiments by the end of 1951. 1953: Mao Zedong declared that “China’s navy must have jumbo ships” while visiting the Luoyang frigate. 1954: First flotilla of destroyers and submarines and the first division of naval air force was set up. 1954: The PLAN set up its first division of Marine Corps in December 1954. The division was cancelled in 1957. The country also bought technologies and materials from overseas countries to build modern frigates in the middle of the 1950s. 1955: The PLAN boasted more than 800 vessels, 515 aircraft, and 600 anti-aircraft guns. 1955-1960: The PLAN established the Donghai Fleet, Nanhai Fleet and Beihai Fleet, successively. 1957: The PLAN established ten academies and six preparatory schools and had provided professional training for more than 14,900 military officers and 21,500 soldiers by the end of 1957. 1960s: The PLAN gradually replaced its coastal anti-aircraft guns with missiles. 1971: China launched its first self-designed conventional powered submarine. 1974: The PLAN’s first nuclear submarine was put into service. Post-1978: The reform and opening-up drive in 1978 helped China upgrade its technology levels. The PLAN also accelerated its modernization process. The PLAN gradually equipped itself with second and third-generation missile destroyers, frigates, landing ships, mine-sweepers and ocean supply ships. 1979:The PLAN rebuilt its Marine Corps, consisting of armored troops, combat divers, chemical defense corps and amphibious troops. China succeeded in landing a ship-borne helicopter onboard for the first time. The PLAN realized a strategic transformation to offshore defensive operations in the 1980s. The PLAN gradually replaced coastal shore-to-ship missiles with new mobile shore-to-ship missiles in the 1980s. 1981: The renovated missile destroyer Jinan was equipped with a ship-borne helicopter platform and the satellite positioning system. 1982: China succeeded in launching submarine-to-ground missiles from an underwater conventional powered submarine. 1983: The PLAN’s first nuclear ballistic missile submarine was put into service. 1985: A flotilla consisting of destroyer Hefei and supply ship Fengcang visited Pakistan, Sri Lanka, and Bangladesh in November, 1985. It was the PLAN’s first foreign visit. 1988: China succeeded to become the fifth country in the world to launch carrier rockets from an underwater nuclear submarine. The PLAN’s naval air force was equipped with “Feibao” fighter bombers, reconnaissance airplanes, anti-submarine aircraft, early warning and patrol aircraft, and tanker airplanes. Since the beginning of the new century, in view of the characteristics and laws of local maritime wars in conditions of the new age of information, the PLAN has been striving to improve its capabilities of integrated offshore operations, strategic deterrence and strategic counterattacks, and to gradually develop its capabilities of conducting international cooperation in distant waters and countering non-traditional security threats, so as to push forward the overall transformation of the service. A number of new conventionally-powered and nuclear submarines equipped with ultra-long wave communication system, tactical software and automated command systems and intelligent and precision-guided torpedoes were put into service of the PLAN after 2000. The new submarines have lower noise levels, and possess improved capabilities for underwater survival and defense penetration. 2003: The PLAN and Pakistani naval forces conducted a joint search and rescue exercise off the coast of Shanghai in the East China Sea in October 2003. It was the first time Chinese naval forces held a joint exercise with a foreign counterpart since the founding of the People’s Republic of China. 2004: The PLAN and French naval forces held their first joint military exercise off the coast of Qingdao in eastern China. 2005: China and Russia held their first joint military exercises, code-named Peace Mission 2005. The one-week maneuvers, which involved 10,000 troops from the two countries, started in Vladivostok in Russia’s Far East and later moved to east China’s Shandong Peninsula. 2005: The PLAN also held joint military search and rescue exercises with Pakistani, Indian and Thai naval forces. It was the first time the PLAN took part in a joint military exercise in overseas waters. 2008: A three-ship flotilla, destroyers Wuhan and Haikou, and the supply ship Weishanhu, set sail to the Gulf of Aden on Dec. 26, 2008 for anti-piracy missions. The flotilla had escorted more than 100 ships off the Somali coast by April this year. 2009 – The PLAN’s destroyer Guangzhou took part in the ten-day “Peace 09″ military exercise at the Arabia Sea off the southern Pakistani port of Karachi in March. The PLAN deployed a second flotilla consisting of the destroyer Shenzhen and the frigate Huangshan to the Gulf of Aden on April 2,2009. The supply ship Weishanhu, part of the first flotilla, would remain in the Gulf. Currently: China now boasts dozens of squadrons of destroyers, landing ships, and supporting ships in its three fleets. The PLAN has several hundreds of combat ships larger than frigates, with a total tonnage five times as much as that in the 1980s. The number and tonnage of the PLAN’s submarines are also dozens of times more than the early PLAN. All the three photographs in the right are from China Military Online. Read more from, PLA Navy International Fleet Review. On April 23 afternoon, Chinese President Hu Jintao, also chairman of the Central Military Commission, was accompanied by PLA Navy Commander Admiral Wu Shengli aboard the destroyer Shijiazhuang to review the International Fleet. 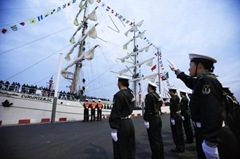 The review parade displayed 25 naval vessels and 31 aircrafts of the PLA Navy. Also for the first time two nuclear powered submarines: the Long March 6, the Long March 3, and two conventionally-powered submarines: the Great Wall 218, the Great Wall 177 were part of the display. Read more from ChinaGate.